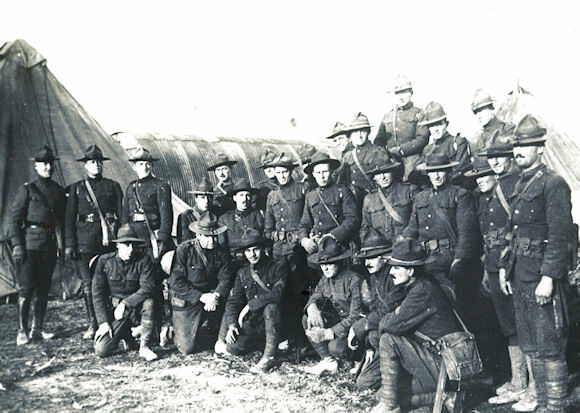 By the end of summer 1917, American soldiers were in France as part of the American Expeditionary Forces (AEF). While mobilization had been rapid, American military leaders were not ready to send American divisions to the front lines. AEF infantry and artillery needed more time to prepare, sending officers and small groups to experience the front. Most American combat troops went into training with British and French armies. A few AEF units went straight to work at the front. 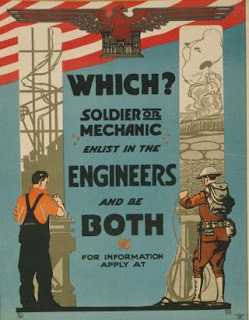 The 11th U. S. Engineers was one of these. The 11th Engineers arrived in England on 27 July. It was the first American volunteer unit to receive the salute of a British monarch. By late August 1917 they were in France at Boulogne and shortly began railroad repair and construction in the British III Army sector. Many of the men had been in the army only a few months. By September their responsibility included almost 120 miles of track behind British lines in Flanders. They took turns at training for gas warfare while working. Serving under British command, American soldiers adapted quickly. American cooks received British Army cooks’ training to adapt to English rations and special arrangements were made to provide coffee instead of tea. American engineer support at the front proved critical at this point in the war. Advances were measured in hundreds of yards or a few miles. The density of men and equipment under regular bombardment strained the road system. Successful defense often hinged on the ability to relocate men, equipment, and supplies. Railroad construction engineers were needed constantly. On 5 September, Company F of the 11th Engineers came under shellfire as they worked in Gouzeaucourt. Sgt. M. Calderwood and Pvt. W. Brannigan were wounded, becoming the first casualties among combat troops of the AEF. Several noncombatant AEF medical staff had been wounded in British lines earlier, but Calderwood and Brannigan were the first combatant casualties. Later that year, in November 1917, 11th Engineers displayed great bravery and fortitude in the face of an intense German counterattack. On 20 November, the British Army attacked toward Cambrai with over 300 tanks in the lead. The Germans counterattacked and penetrated toward Gouzeaucout, where the 11th Engineers were building a rail yard. Engineers working on the rail yard joined British forces, took up rifles, or helped dig foxholes. Some engineers were captured and others scattered into nearby fields. Seven officers and 265 engineers armed with rifles reported to the headquarters of the British 20th Division. They acted as a reserve and dug in new positions. When the British attacked the Germans in the afternoon engineers from the work site went with them and helped free a number of their comrades captured earlier. The British army recognized their contribution in an official communication to the AEF. “I desire to express to you my thanks and that of the British forces engaged for the prompt and valuable assistance rendered, and I trust that you will be good enough to Colonel Hoffman and his gallant men how much we all appreciate his and the prompt and soldierly readiness to assist in what for a time was a difficult situation,” wrote Field Marshal Sir Douglas Haig in a letter to General of the Armies John J. Pershing regarding the 11th Engineers. These were the "Dads" of W W 2 Aviation Engineers, building PSP airstrips in Normandy...and the "Sea-Bees" Naval Construction Battalions running bulldozers like tanks for Marines at "Guadal...", Good to hear it for the..."Can_Do" Engineers! What Happened at the Spanish Lock?